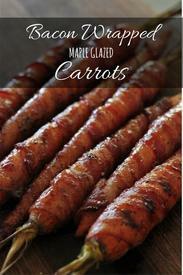 These Bacon Wrapped Maple Glazed Carrots from Hey grill Hey will be the star of your family dinner table. Sweet, savory, and just the right amount of crispiness make every bite better than the last. The crisp Bacon on the outside gets caramelized right at the end with this sticky sweet maple glaze and the carrots on the inside are absolutely the pinnacle of tender perfection. Aside from tasting amazing, these things are beyond simple with only 3 real ingredients and so so easy to prep in advance!